Las propiedades de Es Migjorn Gran son, de media, de 4,6 sobre 5 estrellas. Sea View Apartamento (3 habitaciones) Santo Tomás - Menorca. A tan solo 1 min de la playa. Propiedad 3: Sea View Apartamento (3 habitaciones) Santo Tomás - Menorca. A tan solo 1 min de la playa. Apartamento en la playa, ubicación perfecta. Propiedad 24: Apartamento en la playa, ubicación perfecta. Propiedad 32: Apartamento con excelentes vistas al mar y piscina comunitaria y aparcamiento privado. Propiedad 34: Frente al mar Bungalow con 2 dormitorios y 2 baños. Wi-Fi gratis. Propiedad 46: HERMOSA VILLA CON PISCINA PRIVADA Y JARDÍN PRIVADO, UBICACIÓN PRECIOSA! We loved the house, it is just as the photos we saw, even more beautiful and quiet in real, is located in a very private area which allowed us to feel very comfortable. In the surroundings there are bars and restaurants where a glass of wine watching the sunset enchanted us .... and the unspoiled beach that is only 10 minutes from the house is fantastic. We take a lot of the walks that can be done without having to take the car. The parties on the island with the horses is something unique and very fun I recommend it a lot. 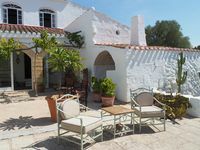 We will return to Menorca and we will surely choose this villa for our future vacations. Spacious and beautiful typical Menorcan house located in the quiet interior of the island but only seven km from some of the most beautiful beaches of the south side. It is a house that has a soul and full of details of good taste. The pool enjoys stunning views and absolute privacy and tranquility. It is a place that oozes beauty everywhere.